John Stott, considered one of the leading evangelical preachers in the last half of the 20th century, passed away before the month of July ended. Having learned of this, I took a break from my studying and composed my thoughts in my private journal. No death, apart from a close relative's, has affected me more than John Stott's. He passed away yesterday. I remember reading his book, "Why I Am A Christian," an autobiography of sorts on how he became a Christian, and "Basic Christianity" which my brother Ralph brought back from Manila . 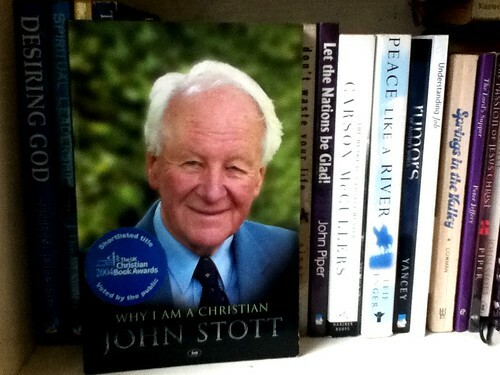 . . John Stott lived a life that glorified his Savior. He ended with a bang—even at the ripe age of 90! . . . How I would like to live like John Stott and finish well! John Stott's passing away has affected me deeply because it was both a mournful and joyous occasion. There is still deep sadness because a great Christian man has left us. But there is joy, too, in that we know what he has left us for: to finally be in the arms of his loving Savior. I would've wanted to meet him in person, maybe ask for his autograph, or ask him why he had remained single all throughout his life, and what struggles he had gone through in his Christian walk. But we'll have the rest of eternity for that. Truth be told, I've often wondered about how I would die. We must think of this earthly life in terms of an impending death to make the most out of what little time we have. And when I try to talk to friends about death, the reactions I get are varied: mostly those of discomfort and panic, as if speaking about death would hasten its coming. But regardless of how I die—whether it be from stage 4 colon cancer or a vehicular crash or something as peaceful as dying in sleep—I want to die knowing that I have lived my life fully for the Lord Jesus Christ. Every Christian must endeavor that. How I long to finish strong in the Lord, like how John Stott did it. These are some of John Stott's books in my brother's library. I highly recommend them. Basic Christianity. A short book that outlines and explains the non-negotiable doctrines of Christianity. Why I Am A Christian. One of the most striking parts of this book was his account of how he came to a saving knowledge of the Lord. Looking back over a long life, I have often asked myself what it was that brought me to Christ. As I have said already, it was neither my parental upbringing nor my own independent choice; it was Christ himself knocking at my door, drawing attention to his presence outside. He did this in two major ways. The first was my sense of estrangement from God. I was no atheist. I believed in the existence of God—someone or something somewhere, the ultimate reality behind and beyond all phenomena. But I could not find him. I used to visit a dark little chapel in school I was attending, in order to read religious books and recite prayers. All to no avail. God was remote and aloof; I was unable to penetrate the fog that seemed to envelop him. The second way . . . was through my sense of defeat. With the vibrant idealism of youth I had a heroic picture of the sort of person I wanted to be—kind, unselfish and public-spirited. But I had an equally clear picture of who I was—malicious, self-centered and proud. The two pictures did not coincide. I was high-idealled but weak-willed. Yet through my sense of alienation and failure the Stranger at the door kept knocking, until the preacher I mentioned at the beginning of this chapter threw light on my dilemma. He spoke to me of the death and resurrection of Jesus Christ. He explained that Christ had died to turn my estrangement into reconciliation, and had been raised from the dead to turn my defeat into victory. The correspondence between my subjective need and Christ's objective offer seemed too close to be a coincidence. Christ's knocking became louder and more insistent. Also: here's Dr. Albert Mohler's interview with him a couple of years ago.